The My Page-module can be used to login and logout and it also provides a way to change profile information and change a user's password. 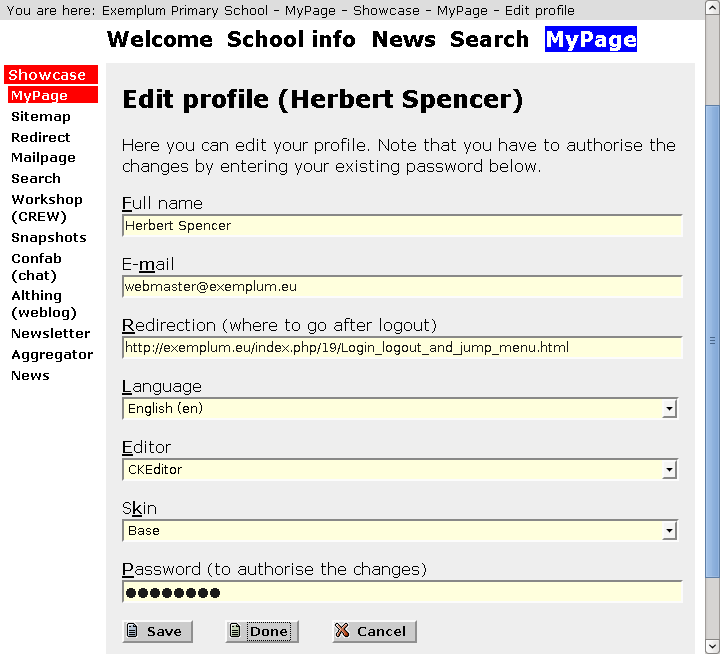 Login: the My Page-module acts as a login screen. Profile: modify personal information (e.g. full name, e-mail address) and preferences (e.g. editor, language). Links to available areas: quick navigation to all areas currently accessible for the user. Links to website management: quick navigation to selected functions within admin.php. 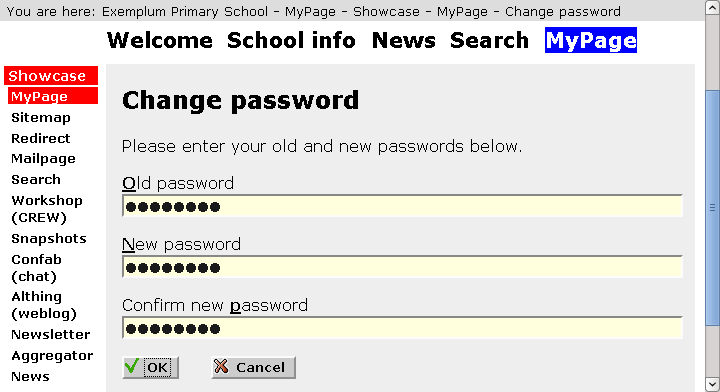 When a visitor is currently not logged in, the My Page-module acts as a login dialogue, much like the one described in section 2.1 Logging in chapter Logging in and out. Username: Enter the username you created during installation or received from the webmaster, e.g. wblade or herbert. Password: Enter the password you created during the installation or received from the webmaster. The password is not displayed, but shown as ******** asterisks. This is a security feature. [OK] or [Enter]: Press the [Enter] key on your keyboard, or click [OK] to login. If you enter an incorrect username/password combination you will be redirected to the regular login page to try again, see section 4.1 Incorrect User name or password in chapter Logging in and out. After entering the correct username/password combination, you see the following. Edit profile: leads to the dialogue where you can review and change your personal information such as your full name and your e-mail address (see section 3. Edit profile below). Change password: leads to the dialogue where you can change your password (see section 4. Change password below). Logout Full Name: ends your session in Website@School. Website@School Start: direct link to the Website@School Welcome page (see section 2.1 Logging in in chapter Logging in and out). Page Manager: direct link to the Website@School Page Manager (see (see section 2. Page manager overview in chapter Page Manager). File Manager: direct link to the Website@School File Manager (see (see section 2. File manager overview in chapter File Manager). Help (opens in a new window): direct link to the Website@School Users' Manual (if installed). 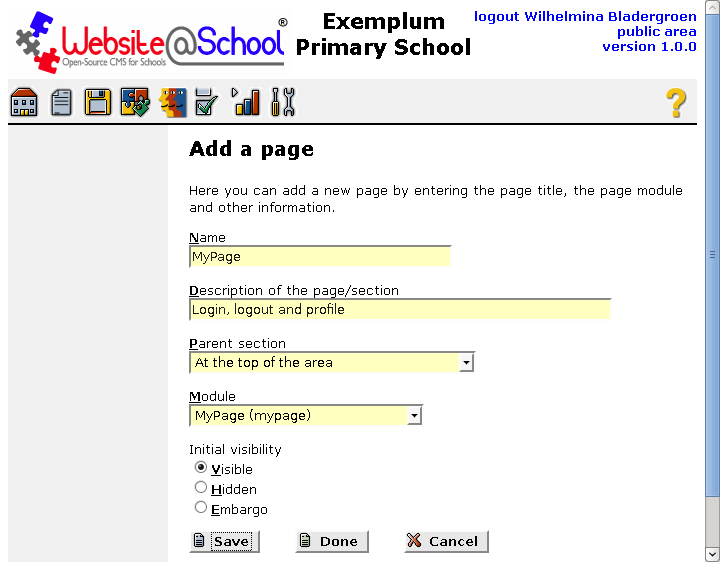 (public) Exemplum Primary School: direct link to this area. 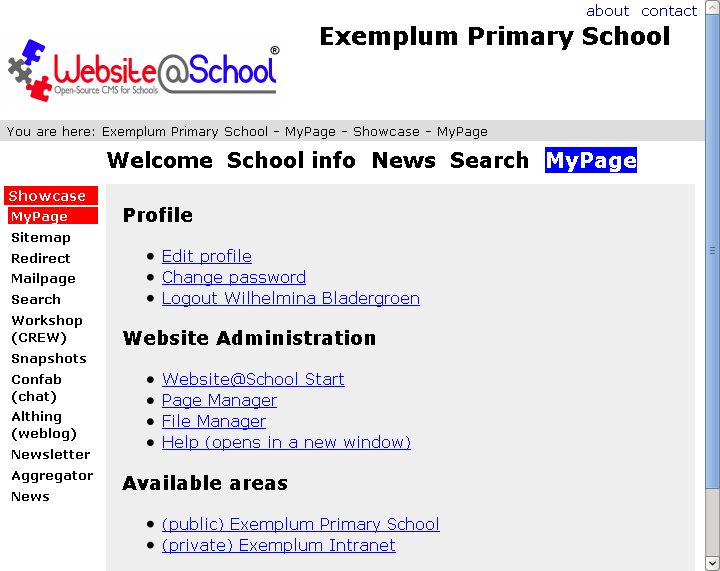 (private) Exemplum Intranet: direct link to this protected area. Depending on the exact website administration privileges the links for Page Manager and File Manager may or may not be displayed. Whenever a regular user, e.g. Herbert Spencer, logs in via My Page the following page is displayed. Edit profile: leads to the dialogue where Herbert can review and change his personal information such as his full name and his e-mail address (see section 3. Edit profile below). Change password: leads to the dialogue where Herbert can change his own password (see section 4. Change password below). Logout Full Name: ends Herberts session in Website@School. Herbert has no webmaster privileges. As a result the section Website Administration is not displayed in Herberts My Page. 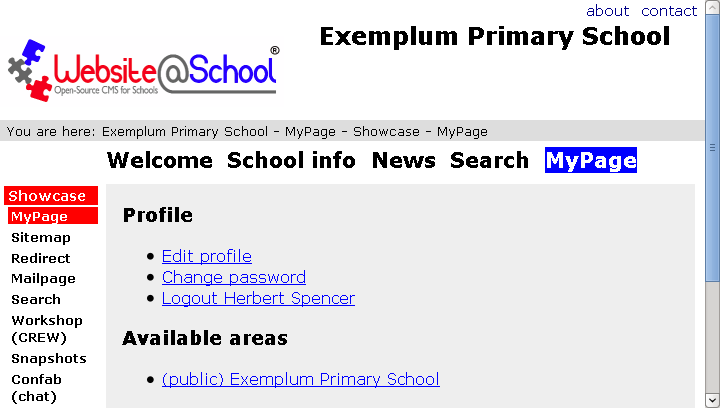 Herbert also has no access to the Exemplum Intranet, hence the link to that area is not displayed in the section Available areas. After Herbert clicks the link Edit profile the following dialogue appears. This dialogue looks a little bit like the one introduced in section 3.2.1 Basic: Edit User username (Full Name) in chapter Account Manager. Full name: The full name of the owner of this account. This name can be changed. E-mail: The e-mail address of this User. This e-mail address is used to send an e-mail when the password is not known anymore. Redirection (where to go after logout): If this is left blank, the User is redirected to the regular login dialogue after logging out. If a complete URL is specified, the User is redirected to that location. Language: The dropdown menu shows the languages that are available to this User. The name of each language is shown in its own language. Changing the language takes effect after the next login. Editor: The dropdown menu gives access to the editors available to this User. Skin: The skin defines the 'look and feel' of the management interface. Changing the skin takes effect immediately (see section 5. Skins in chapter Account Manager). [Save], [Done], [Cancel]: Please refer to section Save, Done, Cancel in the chapter Basic procedures for beginners for more information. Password (to authorise the changes): It is necessary to enter the password (again) to authorise the changes. This is a security measure. After successfully storing the changed profile data the following message is displayed: Success saving changes in account herbert (Herbert Spencer). Redirecting the user to the My Page-page (e.g. to http://exemplum.eu/index.php/19/Login_logout_and_jumpmenu.html) after logout keeps the user on the site instead of taking her to the regular login dialogue. It is not possible to change all aspects of the user account via Edit profile: properties like Name, Active user, Groups and Intranet access can only be changed by an administrator who has access to the Account Manager, see section 3.Users in chapter Account Manager. After Herbert clicks the link Change password the following dialogue appears. Old password: Enter your current password. New password: Enter a new secure password (see section 1.4 Password requirements in chapter Logging in and out). Confirm new password: Retype the new password. [OK]: Press the [OK]-button to submit the changes. After storing the changed password the following message is displayed: Your password was succesfully changed. In the Page Manager, select the Area (e.g. 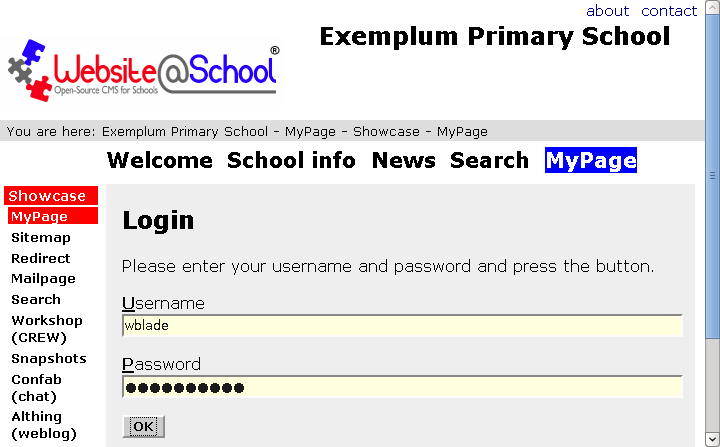 Exemplum Intranet) and click on the Add a page link. The following dialogue is displayed. Enter the necessary data to the fields, as discussed in section 3.1 Add a page in chapter Page Manager. In the Module dropdown menu, select the module MyPage (mypage). Remember to select Visible, Hidden or Embargo. Press the button [Save] to save your work. The following message is displayed: Added to area 2: new page 58 MyPage (Login, logout and profile). Click on the Content link. The following dialogue is displayed. No content configuration is necessary for this module. The advanced options also apply to this module. In particular it means that you can use Bazaar Style Stylesheets (BSSS) to add styling to My Page. See section 3.3 Advanced: Edit advanced properties of page nn in chapter Page Manager for detailed information about advanced properties. Not all themes have the option to show a drop down menu that facilitates navigation to other areas (public or private). Adding a page with the MyPage-module in each ara would make it easier for logged in users to navigate between areas.